Sponsorship opportunities are available for our special 2016 Coal Mine Tour Map. CMI Publishing has been authorized to print this popular commemorative map, originally printed in 1998 in honour of the 100th anniversary of the Rocky Mountain Coal Branch. The reprinted map will be distributed for free by Information Centres. Business that cater to travellers will particularly benefit from advertising on this map. Your advertisement will also appear on the digital edition of our map, which will reach even potential customers. 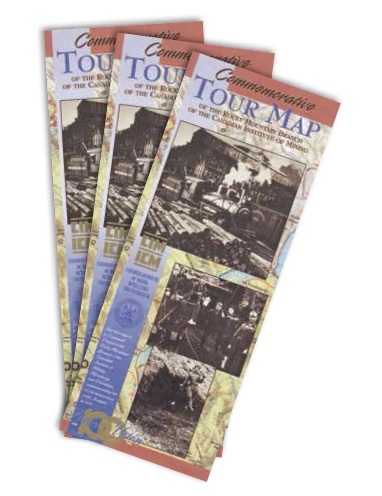 Sponsors will also receive 25 free copies of the Commemorative Tour Map, which includes a detailed coal mining map and a unique overview of the railway and the communities it served. Click here to view the ad sizes and prices as outlined in the media kit. You can view a mock up of the Commemorative Tour Map here.